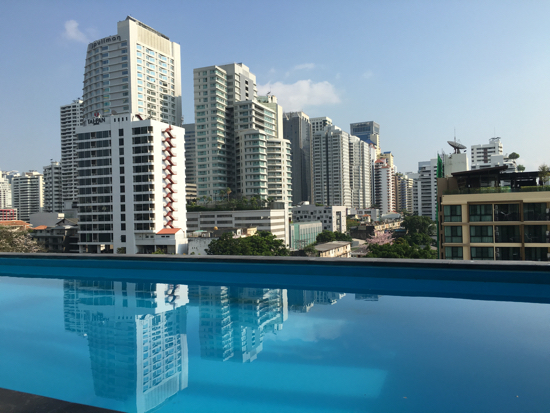 Tucked-away Tints of Blue is an excellent midrange option for the Sukhumvit area, boasting a small pool with great city views, friendly staff and spacious, thoughtfully appointed rooms. Ad Book now! Rates from US$60.05++. Average rating 8.5 from 1,139 reviews. Murals lend an arty touch. The 42 rooms are spread across seven floors, with the eighth floor home to a modest pool and gym that has great views of the buildings marching down Sukhumvit Road — it’s not a riverside view, to be sure, but it gives you a sense of the vast size of the city and shows how development has followed this key arterial road. 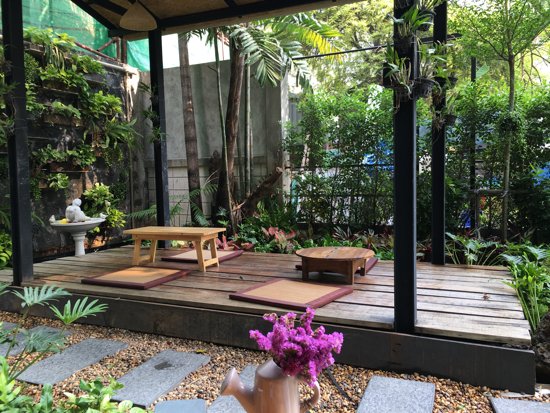 It’s about a 700 to 800 metre walk to MRT Sukhumvit, Asok BTS and Terminal 21, and a slightly longer distance to Phrom Phong BTS. The distance means you get to stay in a quiet, green neighbourhood. The buildings march down Sukhumvit. Spotless rooms come as “studios” and “studio deluxes”, with seven different stylings available. It’s all pulled together in a not quite unified, kind of eclectic, boho sort of way, which we found rather charming. 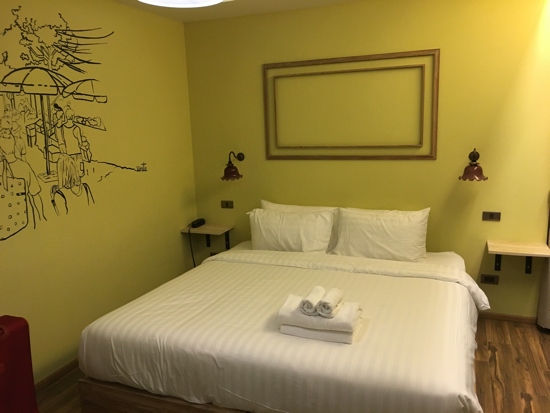 We stayed two nights in a lemon-hued “Bangkok Blue” deluxe, painted with a simple mural accent on one wall. 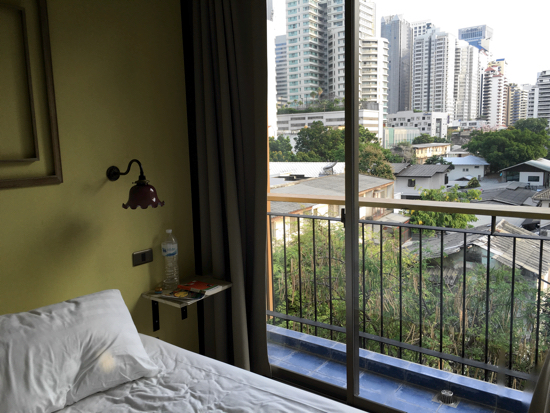 Most impressive though were the floor to ceiling windows offering the same great views down Sukhumvit (our room was fifth floor). Pretty colonial-style ceramic tiles that feature elsewhere in the hotel common areas decorate the floors, lending a sort of countryside feel that’s both homey and cute. Not a bad bedside view. The kitchenette is a bonus at this pricepoint, coming with a fridge, two-plate stove top, microwave, sink and tea- and coffee-making facilities. It’s minimally equipped — more suited for reheating food than making gourmet meals from scratch — but it will all do at a pinch. 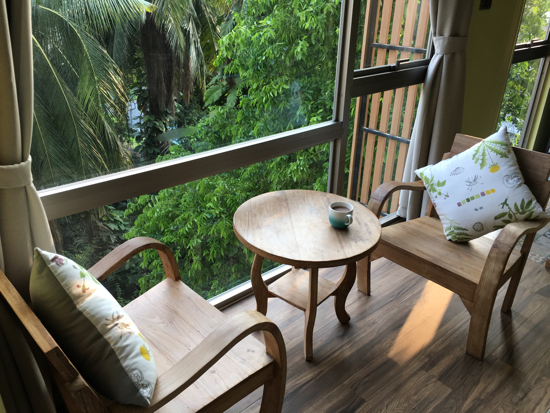 No balcony but a modest sitting area. In the bathroom space is a bit tight in the toilet cubicle, but the shower offers good heat and pressure, plus decent quality toiletries. 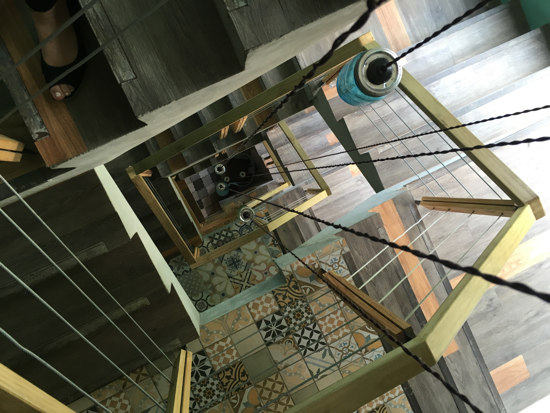 Artsy items decorate the walls throughout the hotel, and while we are sick to death of mason jars, they sort of work in an interesting way hanging down the empty space in the middle of the eight flights of stairs — don’t worry, there’s also a lift. Mason jars: When will they stop? A free on-the-hour shuttle tuk tuk down to the main road sweetens the deal. The tuk tuk was out of commission during our stay, but staff were apologetic and it did seem like it was a short-term problem. The free WiFi at least worked well. You could settle in here for a bit. The pool is small but big enough for a few relaxed laps, and the gym, equipped with a handful of treadmills and weights machines, overlooks the neighbourhood and pool. Only a few deckchairs are available, so expect them to fill fast. The included breakfast is served in the welcoming ground floor restaurant — if it’s not too humid, head out to the salas to chill out instead. A solid breakfast served in lovely surrounds. 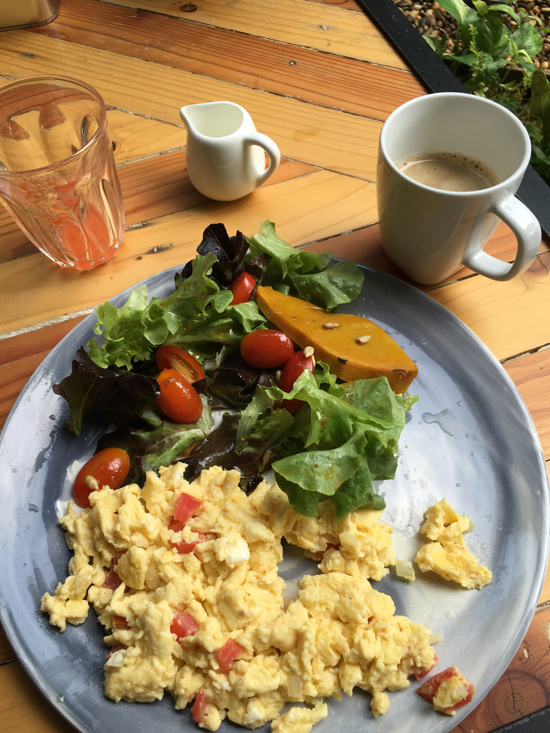 The breakfast comprises (decent) coffee or tea, a juice of the day, eggs any way with a side of ham and a delicious seed-sprinkled pumpkin salad, or go for the changing daily special instead. In addition, you can help yourself to the self-serve buffet of yoghurt, cereals, toast and fruit. If the heat’s not too bad, curl up and eat in the garden. We paid 1800 baht with booking.com, the same as Tints of Blue’s own online rate, but now it seems you can shave 200-300 baht off by booking with Agoda.com — have a search around once you know your dates. Longer-term deals are also on offer but you need to contact them directly for a rate. This is a lovely local neighbourhood, with a few rare spare blocks scattered around and filled with greenery. 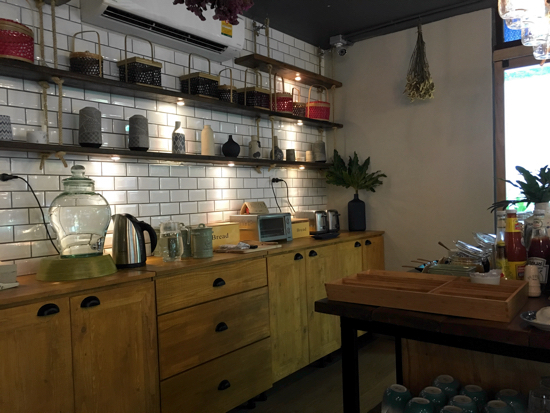 There’s not much happening on Soi 27 itself, but you can easily cut through to restaurants on Soi 23 a few minutes’ walk away and across to Soi 31 — long-running Bella Napoli and newer Appia are among the standouts here. Bicycles are available free of charge to guests. 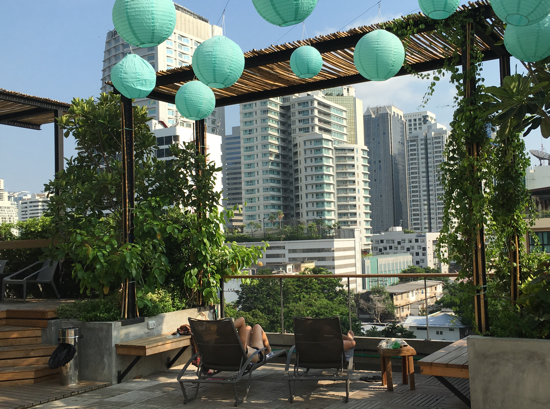 While you wouldn’t want to zip along Sukhumvit unless you’re familiar with Bangkok’s traffic rules, the quieter sois should be fine to explore with care. We found the staff at Tints of Blue refreshingly friendly and eager to be helpful, unlike the somewhat more jaded staff around the corner at funky Retroasis. Perhaps they too will get sick of travellers and their needs but for now, we highly recommend a stay here where you’ll feel genuinely welcomed. Last updated on 11th May, 2016. Check rates at Tints of Blue on Booking.com.